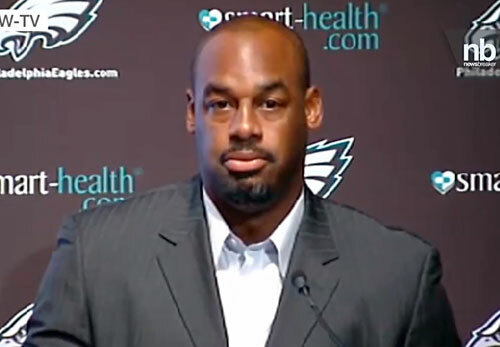 PHILADELPHIA, PA. — Philadelphia Eagles QB, Donovan McNabb, ended his NFL career with an apology. McNabb, 36, made his retirement official in a press conference Monday morning, July 29, as he appeared with his teammates at the Novacare Complex in South Philadelphia. In an emotional speech, the future Hall of Famer thanked his team, long time coach Andy Reid (who is now with the KC Chiefs), his fans and his family. Photo shows Donovan McNabb speaking to the press after announcing his retirement on July 29, 2013. McNabb played 11 of his 13 seasons with the Eagles, leading them to 8 playoff appearances, 5 NFC East titles, 5 Conference Championsip games and 1 Super Bowl loss (his only regret). During the press conference he said that he was sorry he couldn’t win a Super Bowl championship for the city. McNabb will be the last Eagles player to wear the number 5 on his jersey. Mcnabb will be honored at halftime in a cermony during a home game against the Chiefs on September 19, at Lincoln Financial Field. McNabb, who played for the Eagles, Redskins and Minnesota Vikings, is a six-time Pro Bowler. He is the Eagles’ all-time leader in career wins, pass attempts, pass completions, passing yards and passing touchdowns. If you would like to book football speakers or athletes like Donovan McNabb for a speaking engagement, autograph signing, product endorsement, Super Bowl party, golf tournament, charity fundraiser or special event, you can request Donovan McNabb agent and speaker fees at Sports Speakers 360. For booking agent and appearance fee information on how to hire Philadelphia Eagles players for appearances, call 1.855.303.5450.